� Do more and better than iTunes. � Supports all iPad/iPhone/iPod models, latest iPhone 6, iPhone 6 Plus, iOS 8 and iTunes 11. 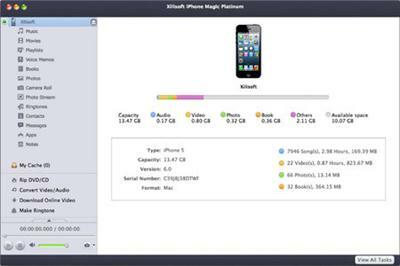 � Transfer all multimedia files between device and PC/ Mac/iTunes. � Convert incompatible Video/Audio/DVD/CD to iPad/ iPhone supported formats. � Download & convert online videos (eg. YouTube video) to play on iPhone/iPad. Rip CD/DVD, including ISO image files and IFO folders to iPhone/iPad compatible music/movies.